My grandmother’s wartime experience was similar to that of any other young American woman who lived through World War II. She sold war bonds at her university. She worked at an airfield. She volunteered at a hospital. She served on the home front while three boyfriends, several friends and countless acquaintances died on the battlefront. In 1947 she married her fourth boyfriend, a pilot from Malden who would have been one of the first to die over Japan had we not dropped the bomb. 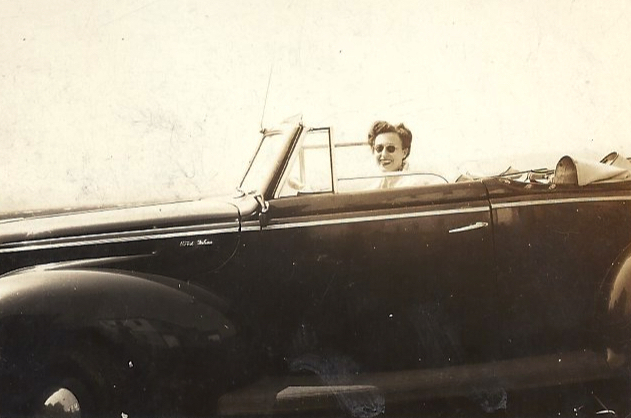 In 1948, she bought her first car. My grandmother’s family’s wartime experience was similar to that of any other European Jewish family who died during World War II. We know what happened to them because the Nazis kept such careful records. Their letters stopped arriving in 1939. Their hearts stopped beating in 1941. They lie separated, scattered in unmarked graves around the outskirts of Vilnius, Lithuania. Our ancestral village is now a grassy field. My grandmother likes to talk about the other Jews. The Jews that got out just in time. The ones who had their passport ready, their bags packed and their gas tanks full enough to get out of Poland, out of Denmark, out of France, out of the Baltics, out of Europe before the tanks rolled in. However small the danger has been since the end of the war, however far off the threat to the Jews, my grandmother has taken the lessons of these few families to heart. Her passport is always ready. Her bags are always packed. Since she bought her first car in 1948, her gas tank has always been full. In recent years, the policies of Israeli Prime Minister Benjamin Netanyahu and his Likud Party-led right-wing coalition have made it increasingly difficult to view Israel in a positive light. As the upcoming Israeli Apartheid Week is meant to remind us, the blockade of Gaza and the occupation of the West Bank has increasingly become a humanitarian and moral disaster. All of the parties involved — Israel, Hamas, the Palestinian Authority, the surrounding Arab governments and extremists from all sides — have all been guilty at one point or another of stalling peace talks and extending this terrible conflict. With the implementation of their aggressive settlement policy, the Likud Party has most recently become the group deserving of the most blame. Let us not conflate the state of Israel and the ideology of Zionism with the policies and actions of Netanyahu, the Likud Party and the extreme Israeli right. To those of you observing Israeli Apartheid Week, I do not ask you to do anything less than unequivocally condemn Likud or Netanyahu, but I do ask that you consider how your condemnations conflate opposition to Likud policy with anti-Semitism and anti-Zionism. The ideology of Zionism is twofold. Firstly, Zionism is the belief that Jews should have a country where we can take refuge from the anti-Semitism and persecution that we face across the globe. Secondly, it is a national liberation movement designed to empower Jews with the right of self-determination. In both respects, Judaism is the foundational component of Zionism. Judaism is the identity that seeks out Zionism to take refuge from persecution, and Judaism is the identity that seeks out Zionism as a means of national liberation. What Zionism is not, however, is an ideology designed to prevent Palestinians (or any other group) from claiming their own right to self-determination. In 2012, Hani Azzam wrote a piece for the Daily in which he related his grandfather’s own painful story. Hani’s grandfather, a Palestinian living in Haifa, was forced to flee his home during the 1947 Arab-Israeli war. Hani writes, “Palestinians mark Israeli independence as Al-Nakba, the great ’catastrophe.’ By ‘catastrophe,’ we don’t mean the creation of a Jewish homeland; rather, we mean the forced removal (through fear and violence) of three-quarters of a million Palestinians whose ancestral threads bound them up with the land so tightly that it required a brutally ruthless, severing cut, rather than a methodical yet deceitful unwinding to separate these people from their homeland.” The atrocity that Hani’s grandfather experienced was not motivated Zionism, but rather a perversion of the most nationalistic aspects of any national liberation ideology. Netanyahu and his Likud Party wish to erase this story from history and continue to pervert Zionism. They wish to continue on a path of settlement, segregation and occupation. A true Zionist, a true supporter of the state of Israel, does not wish to forget the pain suffered by either side of the conflict. A true Zionist fundamentally believes in the values of equality and self-determination. A true Zionist yearns for the day in which both Jews and Palestinians can enjoy a free and independent state in their homeland. Condemn Netanyahu and his Likud Party, not because they are Zionists, but because they are the antithesis of the true spirit of Zionism. The material result of Zionism is the state of Israel, a nation that gives the Jews a home. This nation did not come easily. Countless lives were lost and multiple wars were fought to win this home. Even now, terrorist groups like Hamas and states like Iran wish to see Israel erased from the map. But because the United States and Europe do not actively persecute Jews, many are prone to ask the question: Why do we need Israel? In a recent article in the Atlantic, Conor Friedersdorf reported on the increasing number of anti-Semitic attacks in Western Europe. The article reports that “since 2000, 7,650 anti-Semitic incidents have been reliably reported” in France alone. These incidents include anything from “hate speech, anti-Semitic graffiti and verbal threats … to acts of violence and terror including arson, bombings and murder.” In June, an article in the Wall Street Journal reported on a recent study by the Anti-Defamation League (ADL) in which they found that “74 percent of those surveyed in the Middle East and North Africa … 24 percent in Western Europe, 34 percent in Eastern Europe and 19 percent in the Americas” held anti-Semitic attitudes. In total, the ADL found that almost 1.1 billion people across the world harbor anti-Semitic views. When you consider that the global Jewish population is little more than 14 million people, the number of anti-Semites is staggering. The necessity of a homeland for the Jewish people is no less vital now than it was when Israel was founded. If anything, the Zionist imperative for a Jewish state is greater than ever. The threat to the Jewish people is not some abstract, academic fear of a return to history. It is a real and present danger that Jews everywhere live every day. My grandmother lives this fear. She lives it every time she updates her passport, every time she withdraws way more money than she needs, every time she fills up her car. My grandmother hardly knew her family members who died in Europe, and to this day she rarely discusses them. She much prefers to talk about her father, who fought for his freedom in the 1905 Russian Revolution and fled across land and sea to the United States when it failed. She much prefers to talk about her friends who fought and died in World War II. She much prefers to talk about the Jews who had their passports ready and their bags packed and their gas tanks full. She much prefers to talk about the good, but she lives the memory of the bad. It is for her that I am a Zionist, for her that I hate the Likud Party and for her that I love the state of Israel. She never cried for her family who didn’t get out, whose graves are unmarked in Vilnius, whose village is a grassy field, but my grandmother remembers them every day. Every time she makes sure her gas tank is full. During Israeli Apartheid Week, all I ask is that you do the same.